The order in which you learn how to play things really depends on what you want to play (rhythm, lead, or a mix of the both). With rhythm guitar I'd suggest learning basic chords first such as as: A, C, D, E, G, Am, Em, and so on. 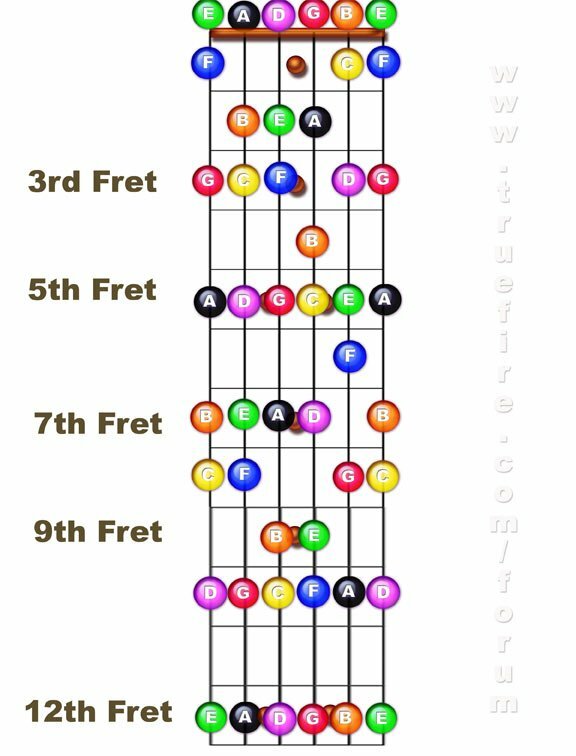 These are the most common chords i play. (if you're wondering where F and B are, those are slightly more difficult to play and id suggest holding off on those for awhile). Once you learn basic chords learn how to play all the major barre chords (and when i say major barres i mean A major, B major, etc.). Once you learn these well enough to play them all without having to think about it, you can move on to chord variants such as adding a minor, 7th, 9th, suspending, and all that fun stuff. I would tab out the chords in this lesson but you are on a site that is a very good resource for guitar players (beginner or expert) and you can click the "Guitar Chords" link up in the top left-hand corner of the page and click whichever chord you want to learn, then click the "get" button. The frets without notes arent labeled because they have two names. lets go with second fret low E string. The note is F#(F Sharp) or Gb (G Flat). This is the same with all other notes, the note one fret higher is the flat, and the note one step lower is the sharp (hopefully you understand what i mean..). There are two notes that DO NOT have sharps, which are F and B. Remember that at the 12th fret, the fretboard repeats itself exactly, which is why the diagram stops at 12th fret. Once you learn the notes (or while youre learning them, memorization bores me after awhile, it may bore you too....) learn scales! many, many, many scales. and when youve learned some, practice them, add your own stuff to em, play em up and down the neck, make them into solos. then learn solos from your favorite songs (tabs are an easy way to do this, but do it by ear if you have the capability, you dont wanna lose it by getting to lazy and using tabs). If you are wanting to learn both i would learn rhythm first because it will help with your soloing. i am a beginner and i was just wondering what i should learn first. like should i start learning chords or licks or what and could i get some practice stuff thanks." i am a beginner and i was just wondering what i should learn first. like should i start learning chords or licks or what and could i get some practice stuff thanks. just one correction: F DOES have a sharp. Must have been a typo because E and B are the ones that does not have a sharp. lame diagram is not appear that's y i am not satisfied. Hey, thanks. I had attempted to learn the notes before I found this excellent website, after a few months of just screwing around and getting no where I stumbled across this. Learned where 4 notes are and jammed for about 30 mins. Woo, feel like I might actually get somewhere.